This garlic chipotle lime chicken is packed with tons of flavor and is incredibly easy to make in the Instant Pot! The chicken is seared and pressure cooked in spicy/sweet sauce for a result that’s sure to make everyone in your family happy! Healthy, hearty, paleo friendly with a Whole30 option. 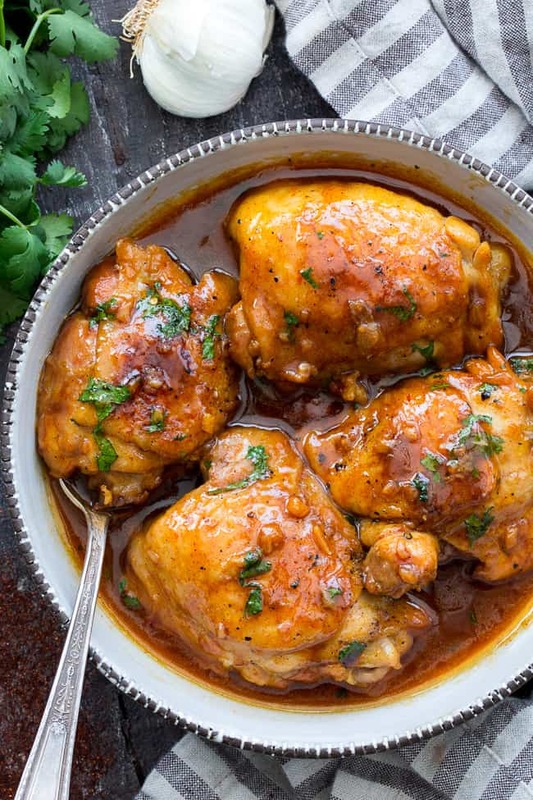 The Instant Pot does it again – deliciously saucy chicken that’s tender, perfectly moist and full of flavor. 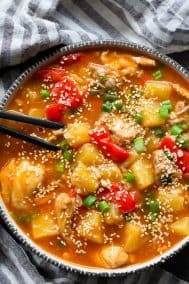 Since creating my sweet & sour chicken and general tso’s chicken in the Instant Pot, I’ve been on a kick and just can’t seem to get enough chicken! I promise, I’ll move onto other meats soon, but for now, we’re still focusing on chicken. This time around, it’s a savory/slightly sweet blend of garlic, chipotle, lime and honey (with the option to use date paste to keep it Whole30 compliant. Anyway, for this recipe I went with bone-in, skin-on chicken thighs, which I used to shy away from but have really been loving lately! The flavor and crispy skin can do no wrong, and they’re SO yummy in a flavorful sauce like this one. I originally thought of making the sauce a simple honey garlic one, which would’ve been delicious on its own, but I happened to have bought lots of limes (thinking I’d make a key lime cheesecake, which is still in the works) and decided to take a spin on the original idea. The sauce itself is still quite simple to make – it uses broth and coconut aminos as a liquid base, along with lime juice and honey (or date paste), spices and a good amount of garlic. After pressure cooking, the sauce is thickened with a bit of arrowroot flour, and then you’re good to go! I love this chicken garnished with cilantro and served with fried cauli rice, which makes the meal ready from start to finish in 25 minutes. You can also serve with roasted potatoes or sweet potatoes and your favorite greens – then again, these are pretty much my go-to sides for basically any main dish! 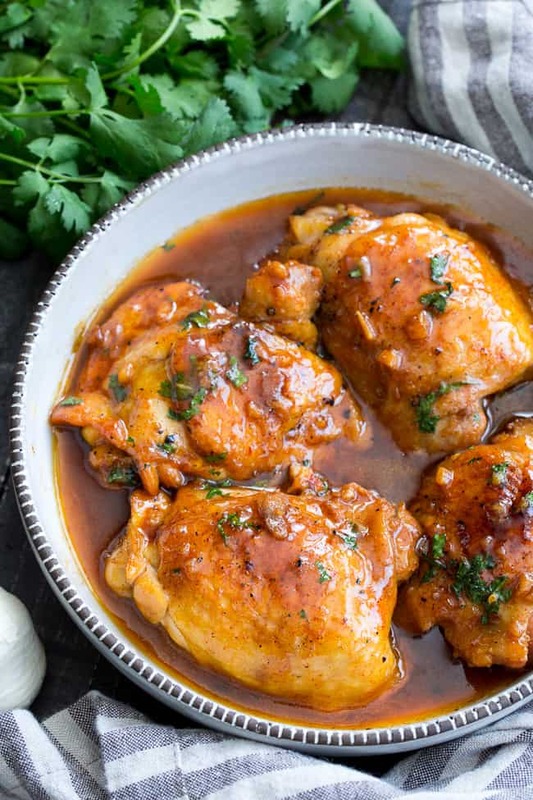 If you don’t have an Instant Pot yet, you can make this chicken on the stovetop by browning it first as instructed, and then simmering it in the sauce, covered, until the chicken is cooked through. Then, once the chicken is cooked, you can thicken the sauce with the arrowroot flour as instructed in the recipe. Okay, I think we’re ready to go! 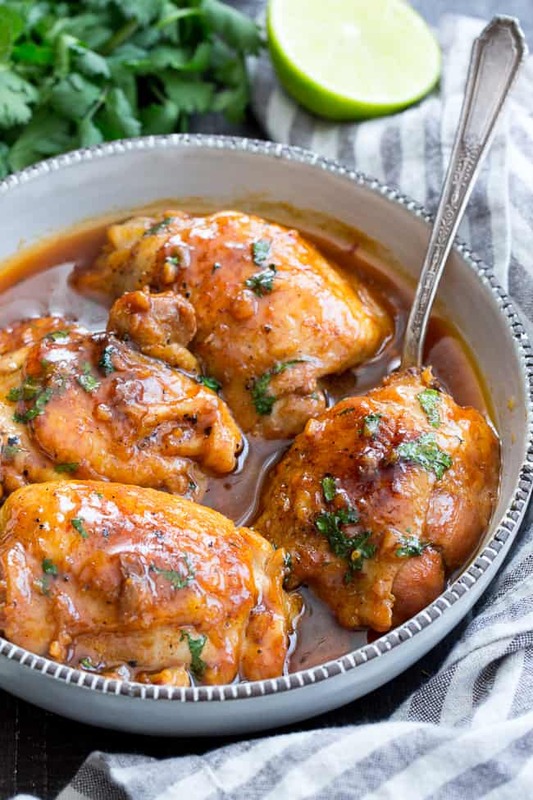 I’m excited for you to try out this garlic chipotle lime chicken – hope you enjoy! This garlic chipotle lime chicken is packed with tons of flavor and is incredibly easy to make in the Instant Pot! The chicken is seared and pressure cooked in spicy/sweet sauce for a result that's sure to make everyone in your family happy! Healthy, hearty, paleo friendly with a Whole30 option. Turn your Instant Pot to “saute” and allow it to heat up, meanwhile, sprinkle your chicken with sea salt and black pepper on both sides. Once pot reads “hot” swirl ghee around the bottom to let it heat. Add chicken, skin side down, and cook until golden brown (about 2 mins) then flip chicken with tongs and repeat on second side. Once both sides are golden brown, return chicken to face up. Sprinkle garlic around the chicken and allow it to cook about 30 seconds, until softened, then press “cancel”. Pour sauce mixture over the chicken, secure the lid, place steam release to “sealing” and set on high pressure for 10 mins. Once time is up, quick release the pressure and remove lid. Using tongs, remove chicken to a plate and set aside while you thicken the sauce. Return the pot to “saute” and whisk together the 2 Tbsp broth and arrowroot, then add to sauce and stir. Cook about 3-5 more minutes or until sauce is thickened to preference. 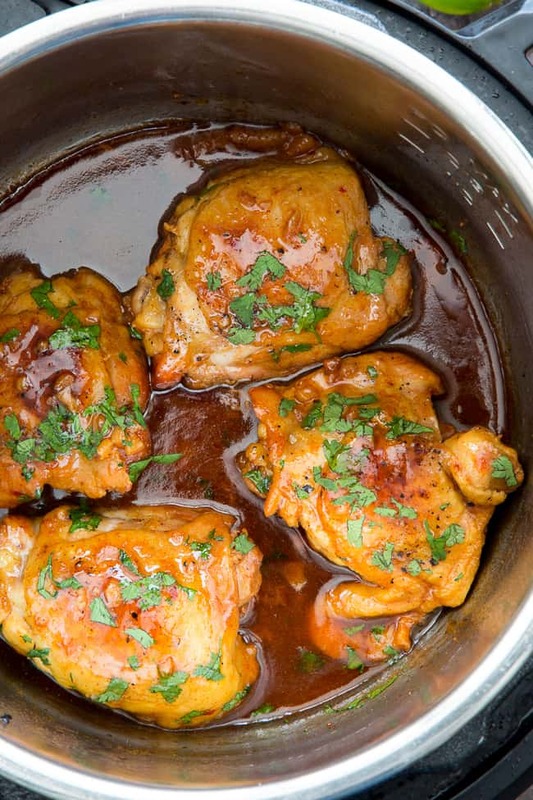 Return chicken to pot with its juices and coat with sauce. Turn off pot and allow chicken to sit 5 minutes before serving. Enjoy! 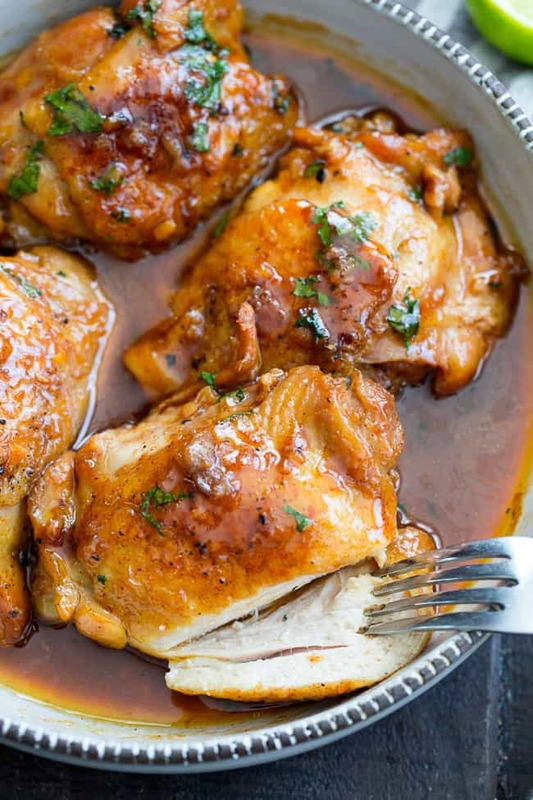 Want More Paleo and Whole30 Chicken Recipes? Try One of These! Is the coconut aminos 1/4 cups? Love this recipe and am eager to try it. Have to say thought, this site is SO loaded with ads, it’s really hard to navigate. it feel interruptive and choppy. While I support your work and admire this site, I’m thinking of not coming back until the noise caused by SO many ads is reduced a bit. Of course you deserve to make money and you do such good work to earn it. I support that. But I support myself also, and just don’t find it pleasant to be assaulted visually by some much promotion. Do you need to change the cooking time if you make this with boneless, skinless chicken breasts? I am the first one to find ads annoying, radio commercials get cut off, tv commercials muted…but when I come to your page I simply am eager enough to see what you’ve invested your time in I simply don’t let the ads bother my stay. Quite simply put you have my favorite foody site. We share the same style and I love what you do. You’re recipes don’t flop and you have a sweet smile. I’m grateful I ran into your page. Keep up the good work! I really appreciate having found you and your food! YOIrw website has become my new cookbook. Last night I made the pork tenderloin. Tonight I’m mking this chicken. I have made several of your desserts and have referred countless people to your page. I’m still wAiting for something to not turn out Delicious. So far I can’t believe how tasty everything is. So just to clarify when you set the IP to pressure cook after the sure the chicken should be skin side up right ? 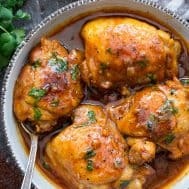 I have the same question as another reader…how would this recipe work with boneless, skinless, chicken breasts? Time in the IP so it doesn’t dry out? Difference in time between using frozen vs. fresh chicken breast? Thank you for all your recipes! Hi, I’m not sure about the fresh/versus frozen, but I’d say for boneless breasts you’d want to reduce the cook time to 5 minutes. I made this last night and omg it was amazing!! I served it with cilantro lime cauliflower rice. Thank you for all the great paleo recipes! Yes you can definitely do that, I’d say probably 400 degrees for about 30 minutes? But you might want to use a meat thermometer to make sure it gets cooked through. This dinner was delicious. I made it on the stove with no problems and served over mixed greens (which I steamed over this sauce, so no extra pots). Your recipes are great! Thank you. I made this last night for the family and it was delicious!! I have also made your mushroom chicken.. however I am in Australia and we don’t have chipotle powder. Too be honest, I’ve never heard of it! I googled recipes, I was wondering if you have a recipe or substitution? I ended up using my lemon and herb mix, but I would love to try it was the chipotle! The chipotle is a spicy, smoky chili powder so anything with some kick would work well – glad you enjoyed nonetheless! Made this using pork tenderloin…so good! 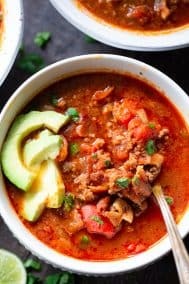 I don’t own an IP, so I am looking to make this recipe either slow-cooker or stove top. Do you have suggestions on either method? First and foremost, I’m not one to ever leave comments on a recipe and because I am, just know this is even better than I’m about to describe. This is the best chicken (Paleo chicken especially) that I’ve had in a long time. There is a beautiful balance of spicy and sweet that I have never met before. My husband told me after his first bite that I need to remember what I did and make it again and more frequently. This was so delicious. Delicious! Yet another winner. Thank you so much! 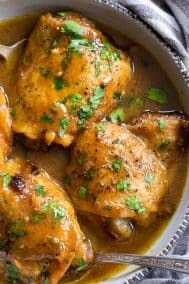 Not sure why this is, but the honey mustard chicken is the same exact recipe as this one. I thought there would be lime in this recipe as well.